Absolutely beautiful tags Janis! Well done with the Brushos and the butterflies are just beautiful! Thank you so much, Di!! The Brusho is such a fun product. I might have to get some more colors of it now that I have gotten a chance to play with this turquoise!!! Awwwww Janis. I'm so honored to be your newest follower and to be featured!!! Thank you!!! I love butterflies and these are both so beautiful! Em, you are too sweet!!! Thank you so much for your kind words!! Thanks so much, Gail!! Brusho is sure fun to use, isn't it?! I totally love doing backgrounds, which is why my craft table is full of them waiting to be made into cards. Hehehehe... I have an idea that Brusho is going to be making my collection increase even more!!! Yippee!!! Thank you for your visit and very nice comment, Cybil!!! 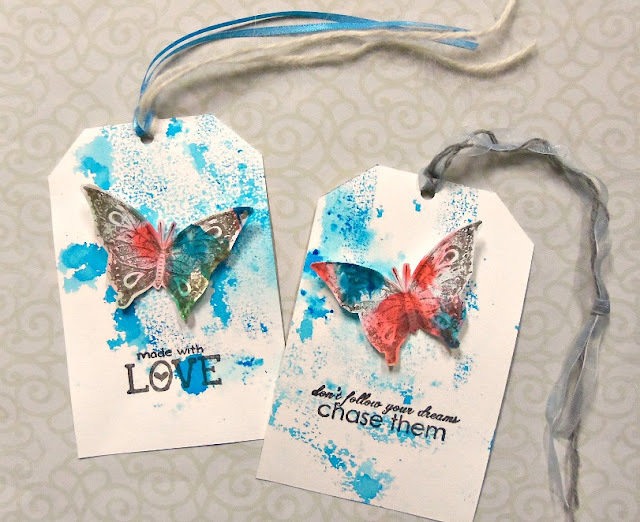 Such fun tags - I love your background and that beautiful butterfly! Apparently, I need to get my hands on some Brusho! I too first saw it on Mandi's blog. Congrats on winning her awesome giveaway! Thanks, Shanna!!! I was just thrilled to win Mandi's prize, esp because of the Brusho....although it was packed with lots of other wonderful goodies, too!!! Brusho is sooooo super-fun. I definitely recommend it!! Thanks for your sweet comment!!! Beautiful tags!! Thanks so much for playing along at CCCB!! Thanks so much, Ros. Your visit and nice words are much appreciated!!! Oh, Mandi.....this is the best way I could think of to thank you....by using this wonderful Brusho prize on my FWF project. :) So much fun!! Thank you for your lovely comment AND for becoming a follower!!! Watch for your introduction when I post next!! Your tags are stunning! Thanks so much for joining us at CCCB this week! Thanks, Stella!! I appreciate your sweet comment so much!! Gorgeous creations!!! Thank you for joining us at CCCB this week! Samra: Thanks so much for your visit and for leaving such a nice comment!! 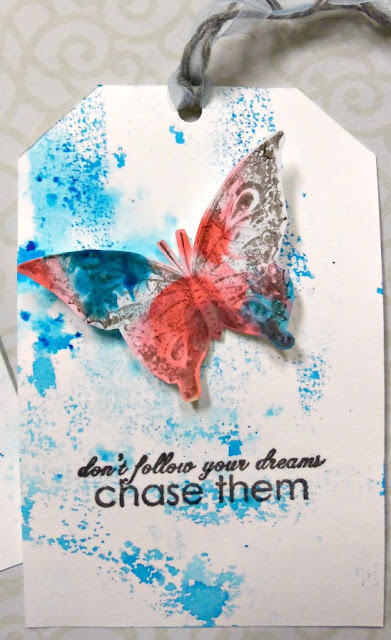 gorgeous stamping ! Thanks for joining in the TIMI challenge at the Craft Stamper! Thanks so much for your nice comments and helpful suggestions!! How in the world did I miss this post?! There are so many "firsts" in this project! 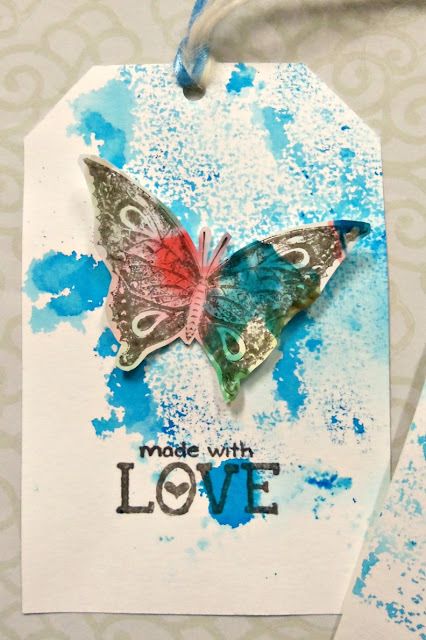 My first look at Brusho, my first look at tags that you cut all by yourself (lol), and the first time you used your thrift store yarn! What is not new is that these are just gorgeous!! The Brusho background is so pretty and I love the way you got two backgrounds out of one sitting by transferring some of the color between them. Those butterflies are the perfect use for your infamous whipped cream background and look beautifully distressed. I am going to have to try stamping in gray instead of black more often because the softer look is really appealing! Thanks for inspiring me and for sharing some of your Brusho!! !